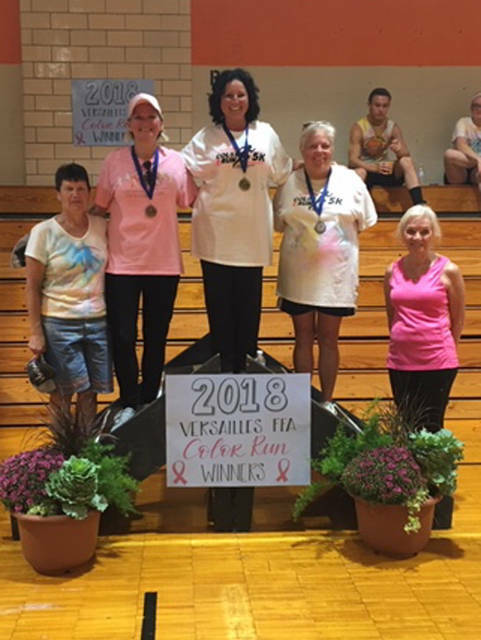 The participants in the breast cancer survivor division included (l-r) Marilyn Dirksen, Linda Rhoades Kathy Magoto, Penny Cromwell and Pat Benanzer. At the Versailles FFA color run, there was a health fair that included many stations for participants to visit and learn about. 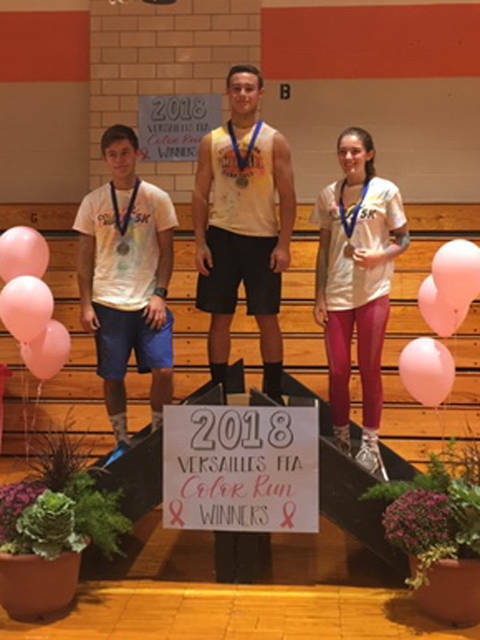 Winners of the 13-18 division of the Color Run included (l-r) Jesse Foley in second place, Franklin Shimp in first place and Keely Tucker in third place. 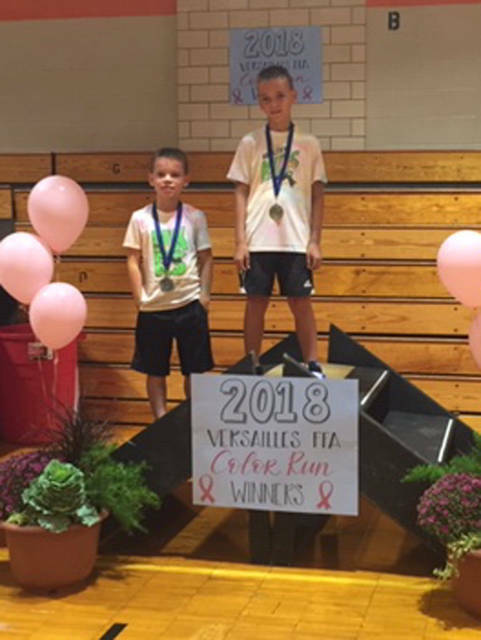 Winners of the 12 and younger division of the color run included (l-r) Blake Pitsenbarger in second place and Ben Pitsenbarger in first place. The Versailles FFA presented the American Cancer Society with a donation check. Members present included (back row, l-r) Elliot George, Jack Gehret, Xavier Grilliot, Kobe Epperly, Luke Billenstein, Noah Barga, Breanna Nieport, Nicholas Didier, Tyler Gigandet, Wes Gehret, (front row, l-r) Taylor Cordonnier, Sam Bensman, Kimberly Winner, Kayla Bohman, Renea Schmitmeyer, Shelbie Schmitmeyer, Lauren Sherman and Sarah Hess. 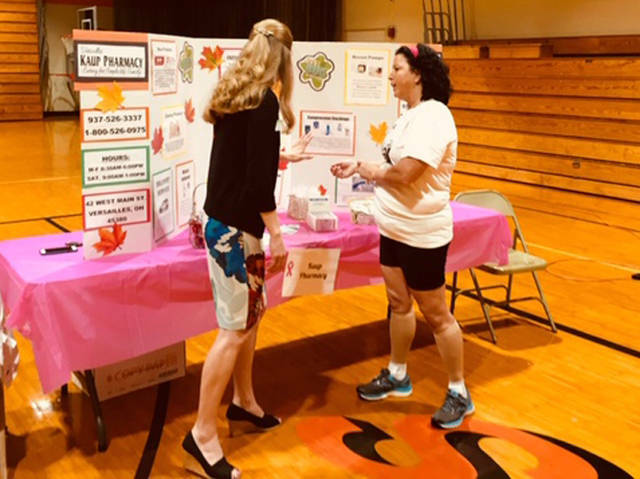 VERSAILLES – As a result of the success of its fourth annual health fair and color run on Oct. 6, the Versailles FFA recently presented a check for $600 to the American Cancer Society with emphasis on breast cancer research. The walk/run was free for all breast cancer survivors, and they all received a door prize. Versailles FFA recognized Marilyn Dirksen, Kathy Magoto, Pat Benanzer, Penny Cromwell and Linda Rhoades, who participated as breast cancer survivors. Versailles FFA, Emily Clark and American Cancer Society donated the door prizes. The color run had approximately 150 runners, and the top three finishers in each age division were recognized. Brian Shappie was the top overall winner with a time of 21:48.8. The top three for 12 and younger division included: first, Ben Pitsenbarger; second Blake Pitsenbarger, and third, Aleena Thomas. Age 13-18 division included: first, Franklin Shimp; second, Jesse Foley; and third, Keely Tucker. The age 19-24 division included: first, Katie Stahl; second, Jenna Berry; and third, Erika Grogean. The age 25-34 division included: first, Brian Shappie; second, Howard Hoisington; and third, Rebecca Grogean. The age 35-44 division included: first, Amy Shappie; second, Philip Rosenbeck; and third, Annie Bergman. The age 45-54 division included: first, Aaron Marow; second, Mark Thomas; and third, Larry Mabbitt. The age 55 and older division included: first, Mike Post; second, James Hubbard; and third, Jim Morchouse. Carolyn Combs led the warm up before the race began. In conjunction with the race, the Versailles FFA sponsored a health fair before and after the race in the high school. The health fair included 10 stations including Kristi Kaiser – 21 Day Fit Challenge; Brown Chiropractic Clinic; Wayne HealthCare; Carolyn Combs – Soothing Touches Massages; Tracy Cordonnier – CPR education; Alex Luthman – Fitness Factory; American Cancer Society; Monica Goubeaux – Mary Kay; Kaup Pharmacy; and Versailles EMS – blood pressure and heart rate checks. Shayna Knack with American Cancer Society helped plan the event and provided the FFA with special equipment. Ken Moorman and Larry Kunk helped with the facility. Versailles FFA member Marcus Berger served as the chair of this activity. MCVTC FFA brought a large number of participants.